If you’re looking for something more genuine to bring home with you instead of the various mass-produced souvenirs that can be found almost everywhere along the streets of Prague, then you should you go to Havelske Trziste. At this market you can find everything from vegetables and fruit to embroidery and other crafts—perfect for bringing home as a memory of your Prague trip. If someone in your travelling party isn’t interested in buying anything, there are plenty of places at the marketplace where you can get a Czech beer. There are always places and sights that you should not miss when visiting a city. 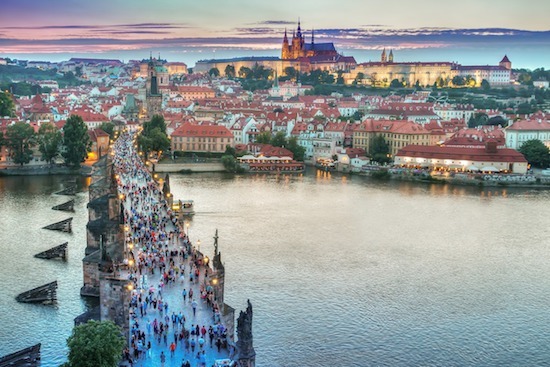 One attraction that falls under this category is Prague Castle. Prague Castle was built in the 1100s and over the years it has been the residence of the kings of Bohemia, the Holy Roman Emperors and presidents of Czechoslovakia and the Czech Republic. Today, it’s one of the largest castles and it’s one of Prague's main tourist attractions. The architecture, the size and the story behind the castle make this one out of the ordinary. Another place that is perfect to visit after a long day in Prague when your legs are weary is Bar and Books. The James Bond feeling is palpable in this high-class bar and allows those who want to relax with a glass of whiskey and a fine cigar. Bar and Books is one of Prague's best and most popular bars and is well worth a visit. Of course, you don't have to enjoy the luxury of whiskey and cigars—the bar also offers several kinds of cocktails and Czech beer. When you’ve had enough of wandering around the streets of Prague and your legs start getting tired, then a trip on the Vltava River is perfect. A ride on the Vltava River provides a unique view of the city with the opportunity to see new details of the cityscape that you might not see from the land. Rowboats and pedal boats can be hired for a fairly low cost, but there are also larger boats with several passengers departing daily. For those who want to get an extra special experience on the water, every night you can take the Jazz Boat, on which you can eat and listen to live music while you get a spectacular view of the illuminated city of Prague. It’s said that Prague is Europe's most haunted city and it is mainly in the Old Town that the ghosts are said to be. For those who dare to, it’s possible to go on a ghost walk along the city's maze-like streets and small alleys. On the tour, you’ll follow a personal guide who tells spooky stories about Prague's past. Although it may be hard to get to sleep after the ghost walk, this is a distinctive attraction to end the day with before going back to the hotel and to bed. The whole family can join in, but if you have very young children, it’s best to let them stay at home. In order to see a different side of the Old Town of Prague, you should visit The Dancing House. The Dancing House is located on the Vltava River and is a special building with comic architecture that’s very different to the eye. This is because the building is not straight but has a jelly-like shape that makes it look like it’s dancing. The shape of the house is like two dancers and the building is also known as "The Fred and Ginger House" after the world-famous dance couple Fred Astaire and Ginger Rogers. The house was designed by Vlado Milunić together with Frank Gehry. Starometskà Namesti's Square is in the heart of Prague's Old Town, which during the 1100s was one of the city's lively marketplaces. Today, the old square is one of the favorite places to visit among tourists coming to Prague. The stunning architecture and beautiful atmosphere, combined with a mixture of old and new, makes the square a place that you absolutely should not miss during your stay in Prague. With the Old Town Hall on one side and the Church of Our Lady Tyn on the other, plus the beautiful St. Nicholas in between, this is a great place to take some really beautiful pictures to take home. Moreover, it is here that you’ll find the famous astronomical clock on the wall of City Hall. The Old-New Synagogue in Prague's Jewish Quarter (north of the Old Town) is Europe's oldest synagogue still in use. The building was completed around 1270 and over the years has been one of the main gathering places for Prague's Jewish population. The specific name comes from the time when it was built, when it was named "The New Synagogue". This name was used for several years by the population, but after several new synagogues were built in the city it got the name "The Old-New Synagogue". Outside the synagogue you will find attractions like the Jewish Town Hall, and nearby is the old Jewish cemetery. On a visit to the Jewish town hall you should take a look at the clock that has both Hebrew and Roman numerals. Charles Bridge is perhaps the main symbol of Prague and is today an extremely popular tourist attraction. The bridge was built in 1357 by the then King of Bohemia, King Charles IV, to replace the former Judith Bridge, which collapsed after a high tide 1342. Through the years, the Charles Bridge was part of a series of historical events and among other things fierce fighting between Prague's population and Swedish army in 1648 took place there on the bridge. The Charles Bridge has been extremely important for the city's population and until 1841 was actually the only bridge crossing the Vltava River. Today there are several bridges that cross the river, but there is no doubt that the absolute nicest way to cross the Vltava is to walk over the Charles Bridge. The bridge is constantly hustle and bustle and you’ll usually come across several street vendors and street artists. If you like cool and action-packed experiences, there are great opportunities to try shooting various weapons in Prague. This is an activity that provides a good dose of adrenaline and even a full aim safety test. There are so-called Prague Shooting Trips organised, where groups go out to a shooting range outside the city to test-fire various weapons. If you stay in a hotel, you can ask the staff if they have information and can tell you more about the opportunities to try sniping in Prague. Of course, you can also ask about different shooting trips in other places where there is tourist information.